The proposal for a EU PNR Directive (Fight against terrorism and serious crime: use of passenger name record (PNR) data (procedure file 2011/0023(COD) ) was adopted by the European Parliament’s Civil Liberties Committee on 15 July 2015. 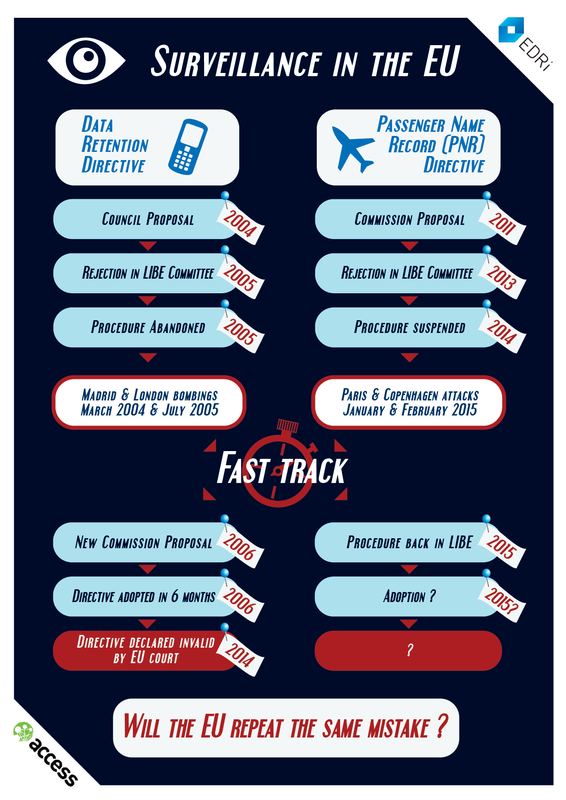 The narrow vote (32 in favor, 26 against, no abstentions) in favour happened despite the rejection of this same EU PNR proposal by same Committee in 2013, despite the Court of Justice of the European Union (CJEU) despite the ruling invalidating the Data Retention Directive last year and despite the referral to the CJEU of the EU Canada PNR agreement. EDRi has repeatedly reported , in line with the opinions presented by a range of independent experts of EU law, that this profiling measure presents serious risks for fundamental rights, that it is not necessary, that it is not proportionate to the aims that seeks to achieve and that it is not even effective. The rapporteur of the proposal, Timothy Kirkhope (UK, ECR) brought the proposal back to the European Parliament (EP) despite the number of criticisms coming from MEPs, civil society organisations, the Article 29 Working Party, the EU Fundamental Rights Agency and the European Data Protection Supervisor. In favour: Heinz K. Becker, Michal Boni, Anna-Maria Corazza Bildt, Rachida Dati, Frank Engel, Mariya Gabriel, Esteban González Pons, Kinga Gál, Monika Hohlmeier, Barbara Kudrycka, Jeroen Lenaers, Monica Macovei, Roberta Metsola, Artis Pabriks, Csaba Sógor, Traian Ungureanu, Axel Voss, Tomáš Zdechovský. When the LIBE Committee of the EP adopted the proposal, it also approved the initiation of trialogue discussions with the Council, which will start next September. The EP negotiating team is composed as follows: Mr Moraes (S&D), LIBE Chair; Mr Kirkhope (ECR), rapporteur, and the shadow rapporteurs Mr Voss (EPP), Ms Sippel (S&D), Ms In’t Veld (ALDE), Ms Ernst (GUE/NGL), Mr Albrecht (Greens/EFA), Ms Winberg (EFDD) plus an ENF Member to be confirmed. – Council document: 5 column table with the proposal for the trialogues (20.07.2015) (pdf).